Performers include: Sean Patrick Flanery, George Hall, Ronny Coutteure, Margaret Tyzack, Lloyd Owen, Corey Carrier, and Ruth de Sosa. The unseen adventures of George Lucas’ movie action hero, Indiana Jones. Through this historical series, we see Dr. Henry “Indy” Jones, Jr. in three stages of his life. 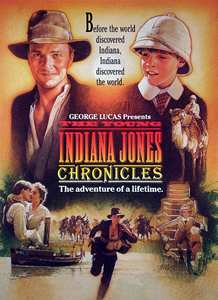 As a 10-year-old boy, young Indy (Corey Carrier) gets his first taste of world travel when his strict father, Professor Henry Jones, Sr. (Lloyd Owen), goes on a world lecturing tour. Traveling with Professor Jones and his son are Indy’s sweet mother, Anna (Ruth DeSosa), and austere Miss Helen Seymour (Margaret Tyzack), the senior Jones’ former tutor who is hired to educate young Indy. Through their travels, Indy meets such influential historical figures as former president Teddy Roosevelt, authors Leo Tolstoy and T. E. Lawrence, and artists like young Norman Rockwell and Pablo Picasso. As a teenager, we find that Indy (Sean Patrick Flanery) has lost his mother and become estranged with his father. During a break from his Princeton high school, Indy travels to Mexico for some excitement. He accidentally gets mixed up in Pancho Villa’s revolution and meets Remy (Ronny Coutteure), a Belgian. Though America is not yet involved in World War I, Indy becomes convinced that it’s a war that must be won. He travels to Europe with Remy and enlists in the Belgian Army under a fake name. While experiencing the heartaches and atrocities of war, Indy meets such historical figures as Charles de Gaulle, Ernest Hemmingway, Albert Schweitzer and Winston Churchill. After the war, Indy returns to the United States and attends college in Chicago. Back in America, he meets historical figures like Elliot Ness, Al Capone, John Ford, Louis Armstrong, and Irving Thalberg. Rounding out the series is the narrator of the show, Indiana as an elderly grandfather (George Hall). He’s seen at the opening and closing of each episode as he tricks unwilling listeners into listening to stories of his adventures.